In the developing world, anemia — a blood condition exacerbated by malnutrition or parasitic disease — is a staggeringly common health problem that often goes undiagnosed. In hospitals everywhere, children and adults with leukemia and other disorders require frequent blood draws to determine if they need blood transfusions. In both cases, doctors are interested in measuring hemoglobin, a protein found in red blood cells. To obtain this basic measurement, health care providers either have to draw blood with a needle or intravenous line, or spend hundreds to thousands of dollars on a specialized machine that measures hemoglobin non-invasively. Now, electrical engineers and computer scientists from the University of Washington have developed HemaApp, which uses a smartphone camera to estimate hemoglobin concentrations and screen for anemia. The new technology is described in a paper that received a “Best Paper” award and will be presented Sept. 15 at the Association for Computing Machinery’s 2016 International Joint Conference on Pervasive and Ubiquitous Computing (UbiComp 2016) in Germany. In an initial trial of 31 patients, and with only one smartphone modification, HemaApp performed as well as the Masimo Pronto, the more expensive Food and Drug Administration-approved medical device that non-invasively measures hemoglobin by clipping a sensor onto a person’s finger. By shining light from the phone’s camera flash through the patient’s finger, HemaApp analyzes the color of his or her blood to estimate hemoglobin concentrations. The researchers tested the app under three different scenarios: using the smartphone camera’s flash alone, in combination with a common incandescent lightbulb, and with a low-cost LED lighting attachment. The additional illumination sources tap into other parts of the electromagnetic spectrum that have useful absorption properties but that aren’t currently found on all smartphone cameras. In the initial trials, HemaApp’s hemoglobin measurements using a smartphone camera alone had a 69 percent correlation to a patient’s Complete Blood Count (CBC) test, a 74 percent correlation when used under a common incandescent light bulb and an 82 percent correlation using a small circle of LED lights that can snap onto the phone. For comparison, the Masimo Pronto’s measurements had an 81 percent correlation to the blood test. The mobile app is not intended to replace blood tests, which remain the most accurate way to measure hemoglobin. But the early test results, from patients that ranged in age from 6 to 77 years old, suggest HemaApp can be an effective and affordable initial screening tool to determine whether further blood testing is warranted. 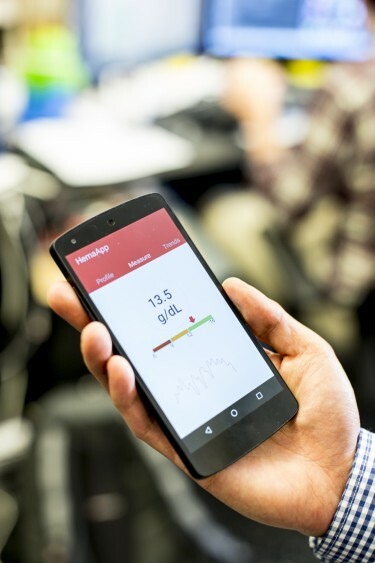 When used to screen for anemia, HemaApp correctly identified cases of low hemoglobin levels 79 percent of the time using just the phone camera, and 86 percent of the time when aided with some light sources. Co-author Terry Gernsheimer, a UW Medicine and Seattle Cancer Care Alliance hematologist and transfusion medicine specialist, said her staff frequently has to draw blood from leukemia or surgical patients solely to measure hemoglobin levels and determine if they need transfusions. HemaApp draws on previous work from the UW’s UbiComp lab, which also developed Bilicam, a mobile app that uses a smartphone’s camera and flash to infer the amount of bilirubin in the blood for newborn jaundice. Bilicam just completed a nationwide clinical trial of 500 newborns. HemaApp bombards a patient’s finger with different wavelengths of light and infrared energy and creates a series of videos. By analyzing how colors are absorbed and reflected across those wavelengths, it can detect concentrations of hemoglobin and other blood components like plasma. To ensure that it works on different skin tones and body masses, the team developed processing algorithms that use the patient’s pulse to distinguish between the properties of the patient’s blood and the physical characteristics of his or her finger. Next research steps include wider national and international testing of HemaApp, collecting more data to improve accuracy rates, and using smartphones to try to detect abnormal hemoglobin properties that could help screen for sickle cell disease and other blood disorders. The research was funded by the endowment of the Washington Research Foundation. Co-authors include UW Department of Electrical Engineering undergraduate researcher William Li and Department of Medicine research nurse Colette Norby-Slycord. For more information on HemaApp, contact the UbiComp research team at hemaapp@cs.washington.edu.